Knappogue Castle with its breathtakingly beautiful enclosed garden is located in the Irish county of County Clare, which is part of the southwest coast of the British state. 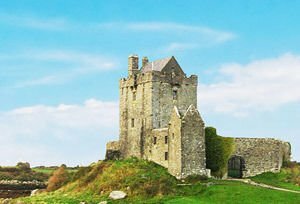 Built in the middle of the 15th century, Knappogue is an excellent example of a fortified tower which was used for centuries as a background and the scene of many battles and confrontations as well as a personal possession. This amazing medieval building was erected in 1467 by Sean McNamara and in the coming years and centuries was marked by a long and intriguing history. In 1571, the castle Knappogue was primarily based on the McNamara family who were Counts of West Clancullen. In 1641 the castle became the center of the uprising, led by the then ruler of his clan McNamara. After the rebellion the mansion remains owned by the family, but that changed in 1659 when the parliament of Cromwell gave Knappogue to Arthur Smith. In 1670 the monarchy was again restored and the castle passed into the hands of their owners, the McNamara family. For the next nearly two centuries, the castle was managed by the McNamara family. In 1800 during the clan decided to sell the estate to the Scotts, who undertook major repairs and restoration work on the structure of Knappogue. The owner changed again in 1885 and then Lord Dunboyne continued the expansion of the fortress. In 1996 the last inhabitants of Knappogue were the Andrews family. They were prominent American architects and sold the castle to the Shannon Development, who wanted to preserve Knappogue castle as an important cultural and historical monument. Today the castle Knappogue is restored to its original appearance of the 15thcentury. Each year from April to October in the mansion, medieval banquets are conducted. During these months the castle Knappogue will leave you deaf for because of the many songs and dances that revel a real medieval flavor.The guests have the opportunity to enjoy the many authentic dishes and drinks, including mead, which was a loved drink of their ancestors.